The next time you're scolded for not making your bed, explain that an unmade bed is healthier than a nicely made one. 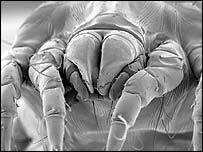 It seems that disarrayed bedding allows moisture to escape, which makes it harder for allergy-aggravating dust mites to survive. Note, however, that this news does not mean that it's okay to go weeks without changing the sheets. And bamboo sheets apparently do a good job of preventing creepy-crawly growth. "Tell me I look lovely, dahling."